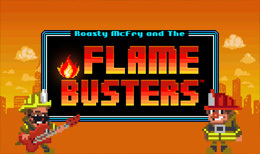 Join the Flame Busters and Roasty Mcfry and extinguish the flames that are engulfing the tower blocks in this 5 reel online slot game. This game includes 243 ways to win and will sure to get your heart rate rising as the heat of the kitchen engulfs you. Once the reels have been engulfed with an inferno of flames you will be lead onto a range of bonus features that will enable you to win and multiply your stake in some fiery bonus rounds. Flame Busters incorporates an affable pixelated graphic theme and will have you sliding down the poll to free spin city. Hitting the online gaming scene in 2012, Thunderkick came with the simple idea to create games that enhance the overall player experience of online casinos. The strategy remains the same - to create unique high-end productions. Their team has years of experience in gaming and game development and platform development is done in-house. The first thing you notice about Flame Busters is the retro graphics. Everything reminds you of an old Nintendo pocket game, including the cheesy sound track and effect sounds. However, you quickly learn in the gaming world that first appearances can be deceptive and Flame Busters is a prime example. Powered by Thunderkick, this slot offers some tidy features and prize offers. Ready to douse some flames across all devices? Before you start, set your bets. They start at 0.10 up to 100, there are five reels and 243 ways to win. It may be 64-bit style graphics, but it's cute to look at and the animations work well. The reels are set in a red brick building, fire escapes sit either side and firemen. In the back ground, a city scape image fills the background. The various symbols sit in the windows. The symbols include coins representing high card values, 10 to Ace they are the low value wins. Then there's an array of odd characters including, a jolly pirate, a fireman and a cat, a robot, a goat and a wizard. And we have a Fire symbol this is a mystery/hidden symbol only revealed when the five reels burst into flames, and the firemen quell the flames to reveal one symbol underneath them all. The Alarm Bell is a scatter. Land 3 or more and you will open the Bonus Feature, Free Spins. Three awards ten spins, four gives you fifteen, land five and you will collect a decent twenty free spins. The Alarm Bells also play a part during the free spins feature and for every 3 you land you will unlock another floor and gain a further two free spins. Five levels in total means there is the potential to snag a whopping 30 free spins. Furthermore, each floor you unlock will launch the Coin Ignition feature where the lowest value coin becomes a Fire Symbol for the remainder of the feature. The aim is to unlock all five, then all five coins will turn into Fire Symbols that transform into any of the other symbols - except the wild and scatter - and you can win bigger prizes! Look out for the Fire Drill feature which is triggered at any time. Here between 1 to 5 of the coin symbols will turn into a Fire Symbol creating the potential for a win to 5,280x your bet on each spin! Within the game panel, you will find all the game information and game settings. Click the chip to reveal the predetermined bet sizes, the icon next to it allows you to set up auto spin. The graphics are cute and the animation fun to watch. In game panels are available offering a few game settings and music toggle on/off. It is visually appealing and after a while, the retro images fill you with nostalgia for the old days of blocky gaming. Flame Busters is a super slot and the old-style graphics quickly grow on you and will definitely appeal to those that love retro games and the style. With a bet range to fit any size pocket and a universal theme, it should appeal to gamers across the board.